The great fun and fascination of a vertical wine tasting – that is, sampling several vintages of one wine style from a single producer – lies in the snapshot glimpses of how the wines in such a series have fared, or might yet fare, over the course of several years. With a group of friends, I recently ventured through five vintages of Brunello di Montalcino from Poggio Antico, an excellent producer of this patrician wine from central Tuscany. The results were intriguing, in a familiar sort of way: As so often happens in vertical tastings, younger wines sometimes proved more readily drinkable than older ones, and comparative qualities changed – radically in some instances — as the wines aerated after pouring. 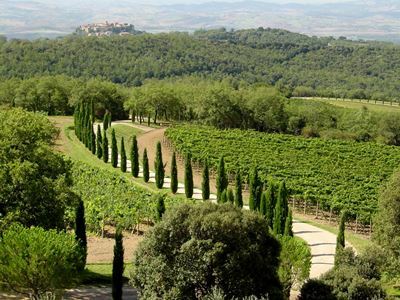 Brunello di Montalcino is made entirely from Sangiovese grapes, the primary component of Chianti. 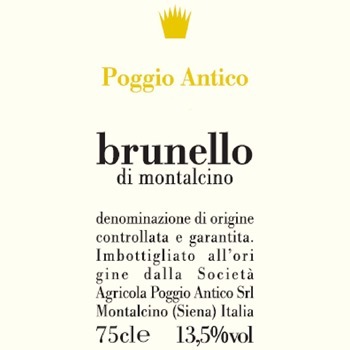 But the aging process for Brunello is, by law, more extended – four years total in barrel and bottle before release. Thus the most recent vintage you’ll find in wines shops now is 2010. And that was the starting point from which this vertical tasting worked backward with stops at 2009, 2008, 2007 and 2004. Typically a concentrated wine possessing the tannins and acid that create complex structure, Brunello characteristically offers excellent aging potential. Our group got a good sense of how this wine can blossom over time in Poggio Antico’s dark, luscious 2004, everyone’s favorite. It was beautifully balanced, the texture plush, the flavors dominated by blackberry and plum. Don’t expect to find the 2004 in stores at this late date. It’s the sort of thing one watches for at auctions. But you certainly will find the evening’s other top pick from this Poggio Antico suite, the splendid 2010, which showed manifold promise of a great future and the age-worthiness to see it happen. While the 2010 shared a brick-red hue with the 2009, 2008 and 2007, it already exceeded those older vintages in terms of body weight, density and sheer brilliance on the palate. Through its still-prominent tannins, one could revel in lovely dark fruit and the first evidence of a complexity that should become stunning with a decade of cellaring. While the Poggio Antico 2009 offered the least engaging profile of this quintet, its siblings from 2008 and, especially, 2007, made strong impressions. The medium-bodied, rapidly evolving 2008 may not have a long life, but it offers present appeal with flavors of plum and autumnal earth. The Poggio Antico 2007 might have been awarded the congeniality prize for its thrilling bouquet of chocolate and blackberry, followed on the palate by rich blackberry with a nice touch of mint. It’s drinking so well that only the most stoic Brunello enthusiast could lay it aside in hope of something still better.